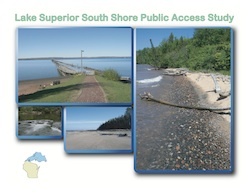 Published in 2007, the Lake Superior South Shore Public Access Study illustrates the various types of public access and recreational opportunities that exist along Wisconsin's mainland Lake Superior coastline and Madeline Island. Sites identified include those which are owned by federal, state or municipal government and managed for public use, public rights-of-way which are suitable for public access and some privately owned facilities which are open to and accessible to the general public. Development of the study was funded by Wisconsin Coastal Management Program and the National Oceanic and Atmospheric Administration, Office of Ocean and Coastal Resource Management.